Our Guest Blog Story comes to us from the mother, Jes, who experienced this birth. One hundred and ten hours into labor, my confidence was waning. It was Thursday. I’d been in labor since the previous Saturday, and for all of that work (without so much as a half an hour of sleep) I had gained just 6cm. However, I knew that with all of the things I’d want done a certain way, I’d need my own doctor in order to be comfortable with a cesarean. With that option no longer a possibility, I was desperate to figure out what was holding my baby up, literally. But in both my labors, I had done every Spinning Babies recommendation I could think of. Again, and again. Not only in labor, but also for months beforehand. I had also done Chiropractic adjustments. And acupuncture. And Dynamic Body Balancing. At 117 hours into my second labor, here I was, a VBAC, desperate to find a way out. I had first met Gail Tully at a conference two years earlier. At that conference, I told her how, despite all of my efforts and exercises, my first birth ended in a Cesarean after 34 hours at 7cm with no progress. Gail had mentioned during her lecture that Spinning Babies maneuvers, when done faithfully, would help most women. But, for some, labor would just click and everything would flow beautifully. As a doula, I’d seen it happen—side-lying release really is magic. For other women, the same maneuvers would allow them to just barely avoid a cesarean—it would still be long and difficult. After carefully asking questions, Gail suspected that the problem area for me was likely my sacrotuberous ligament. 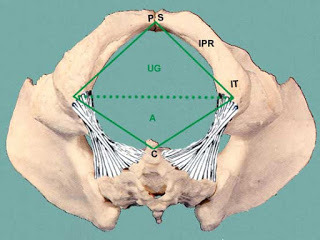 Looking up from the bottom or outlet, of the pelvis we see the sacrotuberus ligament (with the ischiococcygeal ligament) connecting the sacrum to the sitz bones (those you sit on when you sit up). When spasming they shorten. Matthew Duncan, OB, wrote that short sciatic ligaments are short they reduce the room in the pelvic outlet. (same ones, but his name notes their location by the sciatic notch and nerve) Tip: Babies are often engaged earlier than usual and long before labor begins because the inlet of the pelvis is significantly opened by the closing of the outlet. A ligament of the sacroiliac joint, the sacrotuberous attaches the posterior sacrum and upper coccyx to the ischial tuberosities on either side of the body. Ideally, the sacrotuberous ligament is slender enough that it cannot be externally palpated. However, when the ligament is stressed, usually by aggressive physical activity or injury, it can become thick and tight. This can cause a number of issues, including ossification of the ligament and pressure on the pundendal nerve; but the main difficulty for pregnant and laboring women is the shortening of the ligament, which in turn pulls the coccyx and the ischial tuberosity closer together. Besides causing substantial positioning issues for any baby trying to get into that pelvis, the tightening essentially closes off the outlet to some degree, causing long labor by not allowing the baby to pass. 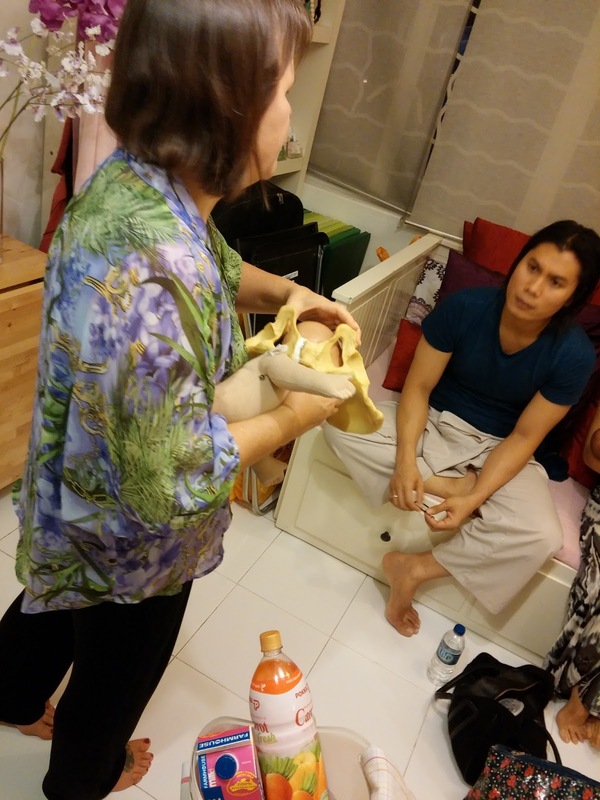 Gail shows a Dad (Mom is just out of view) how a chronically spasming sacrotuberous ligament draws the pelvic outlet closed and because midwives and doctors are often unaware of this possible cause of labor dystocia, the mother has a cesarean to finish the birth. I remembered when we talked at that conference two years previous, Gail had palpated my sacrotuberous ligaments. On my left the ligament was as thick as a pencil and the space between my coccyx and ischial tuberosity was much shorter than normal. Not surprisingly, I’ve had issues with my hip on my left side, and my left leg is shorter than my right, indicating a tightness that chiropractic adjustment would remedy, only to have it return. So when we spoke 117 hours into my second labor, I began to understand that the possibility of the sacrotuberous ligament was the culprit in this, my second and incredibly long labor. After our conversation, I called a physical therapist who agreed to come over and stretch the ligament. Her work on me included testing me for what Physical Therapists refer to as a pelvic upslip (sure enough, I had every sign of one) and treating me for that. After an hour of bodywork for the upslip with a specific focus on stretching the sacrotuberous ligament, labor came on fast and furious, and within a couple of hours, I was 10cm and pushing. Although I had a physical therapist work on me extremely effectively, it may not be necessary in every case. A simple palpation and gentle stretching of the ligament by the birth practitioner, or by the woman herself, may do the trick. [If you succeed at doing this yourself please let me know, I would be interested in how you managed to do it! – Gail] The point here is to stretch the ligament, giving the pelvis it’s natural space and allowing the baby to move freely through it. Consider the sacrotuberous ligament whenever you’ve exhausted your resources in a slow labor. You just don’t know what you might find. 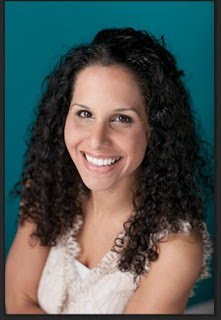 Jes Mejia is a wife, mom, Certified Professional Midwife, Labor Coach, and Birth Educator. 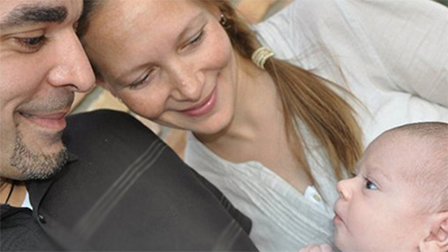 She is the founder of mypeacefulpostpartum.com; a site that gives new and expectant moms the resources and support they need to create their joyful and ideal postpartum experience. Her mission is to help women be fully prepared and supported as they care for themselves and their families through life after childbirth. Thanks for that! I'd really like to know how you would work on that ligament. As an L&D RN, it would be great to learn! Please let me know how I could get information about it! Thanks. See the next post to learn how to work with this ligament. Hi, I am an australian physiotherapist with a special interest in musculoskeletal contributions to labour progress and foetal positioning. Is there any way that I can get in touch with the physiotherapist described in this blog. I'd love to learn more! You can find a Webster Certified chiropractor at icpa4kids.org. Working on the ST ligament is part of the Webster protocol. Get to a prenatal chiropractor and ask for Logan basic and Webster technique. The techniques will help with ligament tension and pelvic misalignment! Good luck, from one vbac mama to another soon to be! This was excellent. Thank you very much for sharing! How do I get to the next post?? Baby #4 for us is coming any day now, and I'm extremely intrigued!! I second finding a Webster certified chiropractor! Night and day between my 67 hour labor and my 19 hour labor. I am looking forward to this next labor. I HIGHLY recommend all pregnant women to see a Webster Certified Chiropractor! I am a retired Rolfer. I get this and it makes sense. Your local Rolfer may be a good resource for clients and also may be open to helping you understand by working on you. Yes, but can you tell us how to stretch it? Thank you for this amazing information. I am wondering, how was it possible to find a physical therapist willing to arrive so quickly and help a woman in labor? I would imagine most would refuse. I'm a physio with a special interest in musculoskeletal contributions to labour progress and foetal positioning. Is it possible for me to be put in touch with the physio described in this blog. I'd love to learn more!